Toxicodendron vernix.© William S. Justice, hosted by the USDA-NRCS PLANTS Database (Accessed 8/2014). 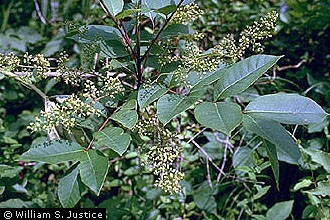 Toxicodendron vernix is a shrub to 5 m tall, often branched from base, bark smooth, gray, young stems with waxy bloom. Leaves alternate, leaf axis often red, blade pinnate, 7-13 leaflets, to 5 cm long, oblong to elliptic, pointed at both ends, margin entire; autumn foliage red-orange (like that of poison ivy). Flowers small greenish; inflorescence axillary, to 20 cm long; blooms May-July. Fruit whitish waxy berries, Aug.-Nov., persisting all winter. Probably eaten by birds, which disperse seeds (see T. radicans). Habitat: Swamps, wet woods, mostly southern NJ and south on coastal plain. Notes: The irritant sap contains the same toxin as poison ivy (Kingsbury 1964).